I’m addicted to Newbery books. I wish schools in Indonesia had Newbery books on their reading lists. The Newbery Medal is awarded annually by the American Library Association (ALA) for the most distinguished American children’s book published the previous year. It started in 1921, with one winner and several (the number differed from time to time) honor books (used to be runner ups). 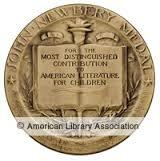 Newbery Medal is only awarded to writers who are citizens/residents in the United States, although this is not the only award for children books in America. When I looked at the list of Newbery winners and honors, I realized I had read plenty (although not that many) of them. I decided to make a long term project for myself, to read as many Newbery books as possible. I will update the list and try to review each Newbery book that I’ve read in this blog. So here’s the list from ALA website. If anyone care to join me, please leave your review link and the title of Newbery book that you’ve reviewed in the comment box, and I’ll try to update the list with your links regularly. Al Capone Does My Shirts by Gennifer Choldenko (G.P. Putnam’s Sons/a division of Penguin Young Readers Group). thanks ya ziyy udah ikutan 🙂 hope you enjoy your first newbery! Ini asik banget. Aku baru tahu Mbak Astrid punya project ini. Susah nggak sih dapet buku-bukunya?